Unbelievably good – this is my kind of read! 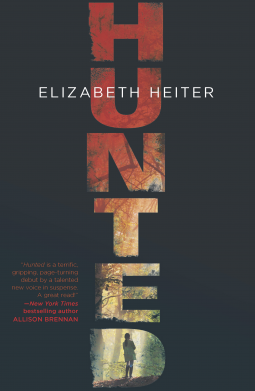 What a fantastic FBI procedural from debut author Elizabeth Heiter. I loved this book- the pace, the characters, the plot, the twists, the action, the tension…I loved it all. Evelyn Baine is a great female protagonist – smart, dedicated, resourceful, a wonderful FBI profiler with a personal history that steers her life – personal and professional. Heiter sets a great crime scene and the office banter and politics adds a further dimension to the narrative. I can see a TV show waiting to explode onto our screens. Heiter gets all the essential elements of a great crime read spot on. I cannot wait for her next book…due out in the New Year, “Vanished” which follows an important story line in Hunted. This entry was posted in Crime Fiction, Post Script: Book Reviews and tagged book review crime fiction, FBI profiler, serial killer. Bookmark the permalink. Carol – It’s very good to hear that you enjoyed this. It’s such a treat to pick up a debut and find you like it that much. Thanks for letting us know. Stay cool…. Margot – I really enjoyed this debut, I think the author has much to offer and I look forward to future works from her. Thankfully this week the temp has dropped…and a prediction of about 28 degrees C for Christmas Day – prerfect! The BBQ is ready to cook Christmas dinner. It was a great read- loved every minute.